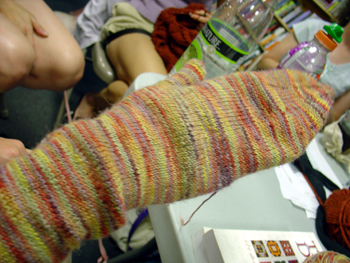 Carol's sock that became a mitten. The Black Bunny yarn was knitting up so nicely she decided it was too sad to have it hiding down in her shoes, so she changed her sock into a mitten! 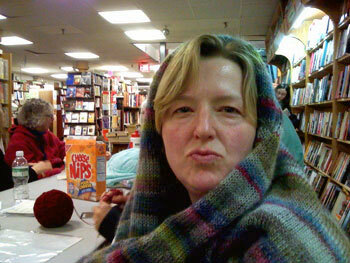 Carol is finishing up her incredible kidsilk haze Earth Stripe Wrap from Rowan magazine #42. 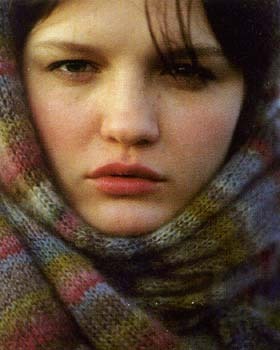 She couldn't resist wrapping it around herself and striking the same pouty pose as the model in the magazine! See Carol's finished wrap on her blog here. 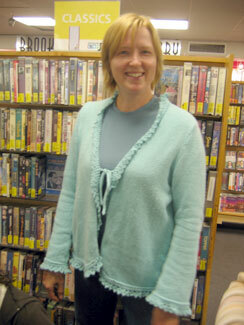 Carol's gorgeous Deli cardigan from Rowan Classic Cafe. 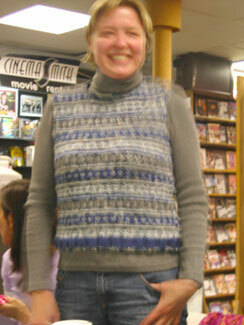 New knitsmith, Carol spent last week at knitting group weaving in the final ends on her beautiful Snapdragon vest. Hooray! Check out the official finished picture (where she's not all blurry!) on her blog here. 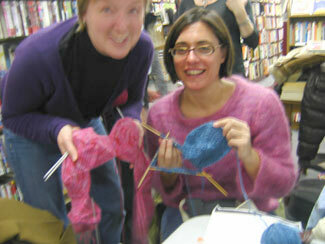 Emily and new Knitsmith, Carol, are both working on hexagons for a scarf from Knitting Nature . Emily says it's hell, but Carol is loving the pattern.